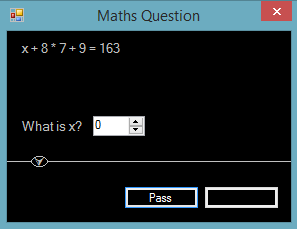 This is an original Maths and Grammar quiz game. The aim of the game is to climb the board to the end square. You decline answering the question. If you have remaining moves, you continue to climb the board. If not, you will be asked another question. Your remaining moves will be increased, and you continue to climb the board. You lose your remaining moves and you are sent back to the previous question square, or if there isn't a previous question square, you are sent back to the start. 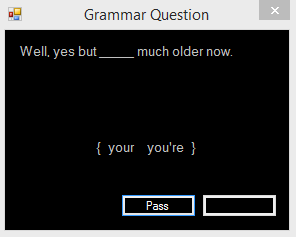 The Grammar questions along with their multi-choice answers and their correct answers are stored in a My.Resources text file.
''' <remarks>Onclick the Label forecolor and fontsize changes.
''' 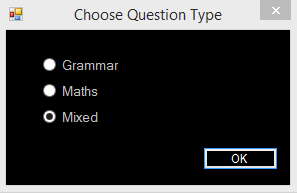 This resets all of the other labels, so only one appears selected. In VB.Net, a lot can be accomplished, while using only minimal controls, and effective coding. The Game 'board' in the main form of this game uses only one image, two Buttons, a PictureBox, and another (custom) PictureBox which has a circular region. All of the question forms also use minimal resources.